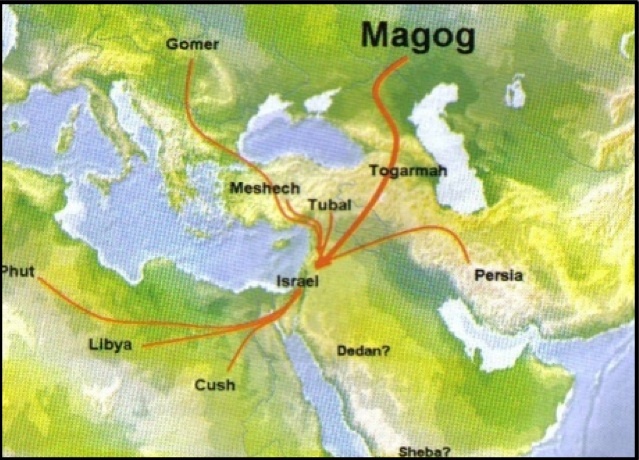 In a recent conversation about events in the Middle/Near East, a question was raised as to the potential for fulfillment of prophecy, specifically concerning “Gog and Magog”. Gog and Magog have so captured the imagination that their very mention seems clouded by mystery and ready at hand to apply to nearly any particularity in contemporary geo-politics involving the modern nation-state of Israel. However, few consider the actual texts where these terms are mentioned in Scripture. Gog (the referent to the prince of the eschatological hordes) only occurs two places in Scripture (excluding the referents which point to a genealogical figure): Ezekiel 38-39 and Revelation 20. In Ezekiel, Gog is the prince from Magog (meaning “place of Gog”). This ruler is brought by the will of Yahweh to a restored Israel to make war. He is gathered with hordes from the corners of the known world (6th century BC). These two chapters are spent describing the hordes and their ultimate destruction and burial. Interestingly enough the valley of Hamon-Gog where the bodies are buried over 7 months immediately follows another valley filled with dead: the valley of very dry bones (Eze.37). That first valley was the slain of Israel, restored by the Spirit of Yahweh and even restored as a united people in the land of promise. This latter valley becomes the resting place of all who would think to destroy the work of Yahweh to live in peace in the midst of His people. While numerous people groups are included in this horde (including Persia [part of modern Iran]…a favorite current target of prophetic prognosticators) the intention is not to locate the people groups specifically. It seems to function more toward all those who are from far away (from the very boundaries of civilization) who would gather together against the work of Yahweh (though brought by the “hook” of Yahweh to the land). This is NOT intended as Ezekiel’s message against a restored Caliphate (something imagined by Muslim extremists and fear-mongering Westerners). Nor is it against any of these people groups. It is against all who would oppose the ultimate plan of Yahweh to dwell with His redeemed people (Israel for Ezekiel, but inclusive of all of God’s people in the NT). In the Revelation 20.8, Gog and Magog function as stock phrase for the opposing hordes from the four corners of the earth in an even more broad sense than Ezekiel. This is in contrast to “Gog” who was “from Magog” in Ezekiel. Here (if one is following a sort of “timeline” of events in the Revelation) is the final battle to end all battles. This one follows the 1000 year imprisonment of Satan and the 1000 year reign of Christ. It immediately precedes the final judgment and the coming of the New Jerusalem and the New Heavens and New Earth. Given the above passages (from a Premillennial eschatology) it should seem readily apparent that anyone attempting to discern “Gog and Magog” in our contemporary setting has no grounds. Not only do the passages not support such an interpretation (even if one is not Premillennial) given their prophetic/eschatological nature to depict things in more broad terms, but they also would not support such following the predominant western Evangelical approach of Premillennialism which would locate this war at the very end of the millennial reign (and distinguish it from the Battle of Armageddon immediately preceding the Second Coming). Meaning it would be a thousand years from the Second Coming. The face of the planet (and her empires) would be radically refashioned from the current geo-political make-up. In brief, finding Gog and Magog in contemporary news and prognostications is biblically unfounded. So stop looking at Russia, Turkey, or Iran. We need look no further than locating it with all who ultimately oppose the rule of the Lord Jesus Christ and his reign over the earth.